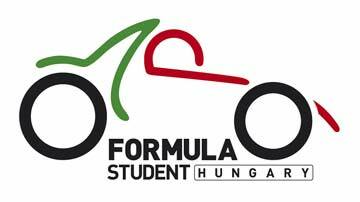 We successfully registered in Formula Student Austria, after answering a pretty challenging and demanding quiz. See you in Red Bull Ring, from the 26th until the 29th of August 2013, with car #33. ...that after long discussion with the team members, we have reached to the following decision.As many of our fans know, we always try to reach the cars' limits. Αccording to this philosophy, in recent months a variety of experimental design solutions were implemented in our car, which made it non-compliant with the technical regulations. Therefore, also because of the limited time and resources, we decided not to modify the car in compliance with the regulations and we do not participate in Fοrmula Student Germany. Furthermore, Prom11B is going to undertake excessive track testing during the autumn time in order to get valuable feedback from the experimental solutions, find the ideal set up and train future drivers. Expect our completely new performance with Susie more wet than ever! We are pleased to announce that our team registered succesfully in the Formula Student Germany from the early registration phase. FSG will be held in the legendary Hockenheimring from July 31st until August 5th. Being full of knowledge and experience, we hope to achieve a rewarding result, worthy of our effort. Prom Racing participates in the presentation of Formula Student Teams in Greece held by the Institution of Mechanical Engineers, Europe - IMechE, Europe. The event will take place in American University of Athens on Saturday, December 3rd . 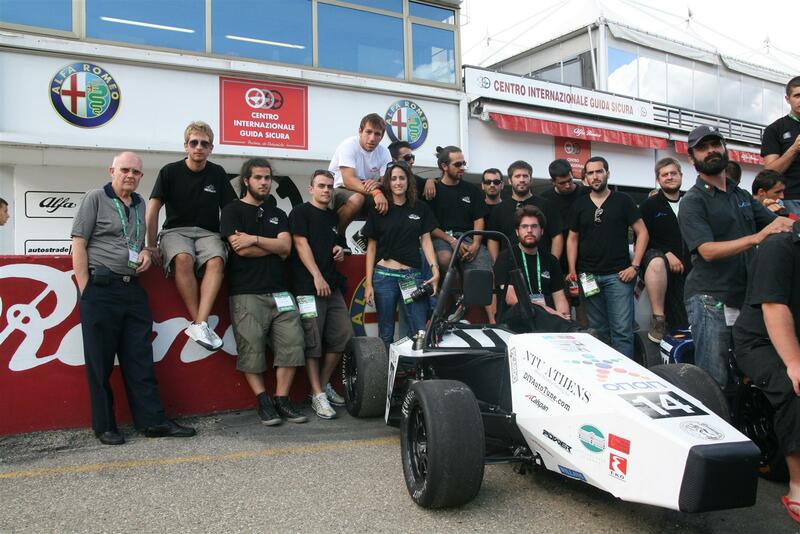 Formula Student Teams of University of Patras - UoP Racing and Aristotle University of Thessaloniki will also present their work in the event. See the official invitation-- Formula Student Presentation . Coming back from Italy's Autodromo di Riccardo Paletti and an event full of surprises. Rain accompanied the 3 day event sometimes causing mishaps but in general made the FSAE Italy 2011 competition a great experience . Having passed scrutineering just from the first day of schedule, our team was free to work on static and dynamic events during the rest of the event. We managed to participate in all events ( acceleration ,skid pad, autocross and endurance) coming off with a good result considering our luck of experience and unpredicted weather conditions. Overall Classification as well as detailed results of every event are available in Formula ATA's official site-- FSAE Italy 2011-Official Results . FSH 2011 impressions and Cost and Manufacturing award! 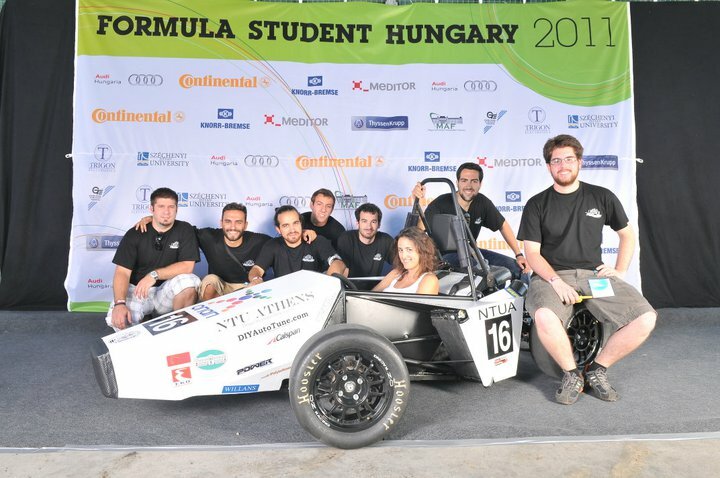 Formula Student Hungary came to an end leaving us with the best of memories. Our presence there is the first attempt of our team to take part in the competition with a car ready to race and compete with numerous other teams from all over Europe. We learned a lot from our trip to Hungary and gained a lot of experience which we expect to be rather helpful in Italy the next weekend when the FSAE Italy competition is taking place. Officials and the judges committee praised our efforts to construct a functional and reliable car despite being a "rookie" team. We would like to thank them for their help whenever it was needed and of course for their cooperation. Despite some technical issues that we faced on Saturday morning we managed to take part in all dynamic events and came up with good results considering the competitors. In static events, after presenting a realistic race car, without exaggerations that keeps the cost at a low level we managed to classify 1st in the respective event of Cost and Manufacturing with an overall of 90.341/100 points! Detailed list with all the results can be found in the FSH 2011-Official Results . OPAP is Grand Sponsor of Prom Racing! Since Friday 11th of March,OPAP, the leading betting company in Greece, is Grand Sponsor of Prom Racing!We would like to thank OPAP for its support and we are aiming at a constructive collaboration. Prom Racing registered for the FS Hungary 2011! Our team managed to be the first to reserve its slot for the starting grid in FS Hungary, after the erly registration for the world's ranking top teams. The competition will take place in the city of Gyõr on 18th of August.Hence,for this year our team will take its chances and attend both competitions in Italy and Hungary! Prom Racing in Formula SAE Italy 2011! This year, following a new SAE guideline, there was a common time frame for submitting a registration application to most of the competitions. 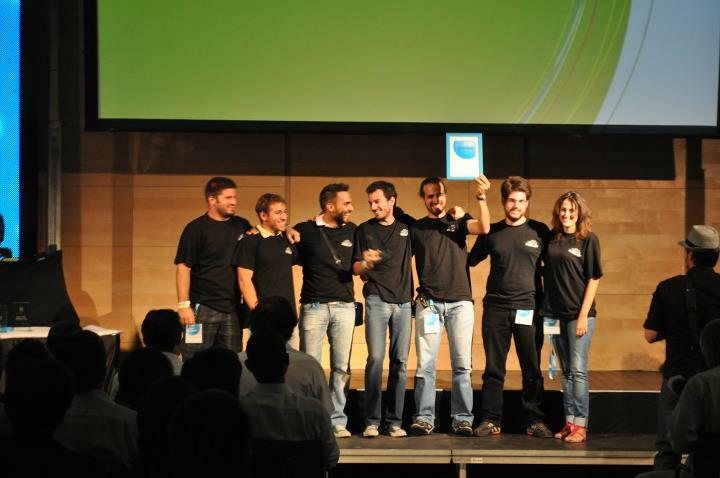 As a result, our team was unable to be among the 78 teams taking part in the German competition. However, we are now officially listed among the participants in this year's Italian competition, hosted at the Ricardo Paletti track on the 2nd of September, where we hope to compete with our new car. The General Secretariat of Youth is, as of September 2010, a Golden Sponsor of Prom Racing, thus proving it substantially supports youth initiative. We would like to thank them for entrusting our endeavor and are looking forward to a fruitful collaboration. As of May 2010, and for a number of issues, the magazine Power Techniques will be covering Prom Racing's progress, providing information about our team as well as presenting technical details about our car. As of July 2010, the greek petroleum company EKO is Prom Racing's Golden Sponsor. The team would like to thank EKO for their support, part of their Corporate Social Responsibility program. Prom Racing is currently in a state of recovery following last year's misfortune in the racing competition. We are readjusting our goals, having learnt from our past mistakes. The car is undergoing major changes, part of it being completely redesigned, so that we can present a more competitive package which can be successfully completed as well as track-tested. To make this happen, we are looking for new resources, both human and financial. Unfortunately, our team is unable to build a fully functioning car for the Formula SAE Italy 2009, mainly due to financial reasons. Our relatively limited budget made it impossible for a competitive car to be completed within the given time frame. However, we are confident that we will be ready for next year's competition. National Bank of Greece (NBG) is sponsoring Prom Racing! Since Friday 6/3/2009 the National Bank of Greece (NBG) is Grand Sponsor of Prom Racing. Our team wishes to thank ETE for their support and especially for their trust and we hope that we will have a successful and useful co-operation. Prom Racing in Formula SAE Italy 2009! Signs from the other two European competitions were bad. At the English competition all positions were covered in a few minutes, while in Germany the demand for a place in Class 1 was surprising: 80 teams applied in the first 8 seconds after the application start time; as a result 40 others were left at the waiting list. Of course, our team could not expect that anything different was going to happen in Formula SAE Italy, where the verification came just 4 minutes after the "window" opened for the applications. Within these 4 minutes all 40 entries for Class 1 were closed, while 30+ Universities were left in the waiting list, among them some of the favorites of the competition. Our team finally managed to lock its participation and will be present at the track of Riccardo Paletti 4-7/9/2009, with its first single-seater! 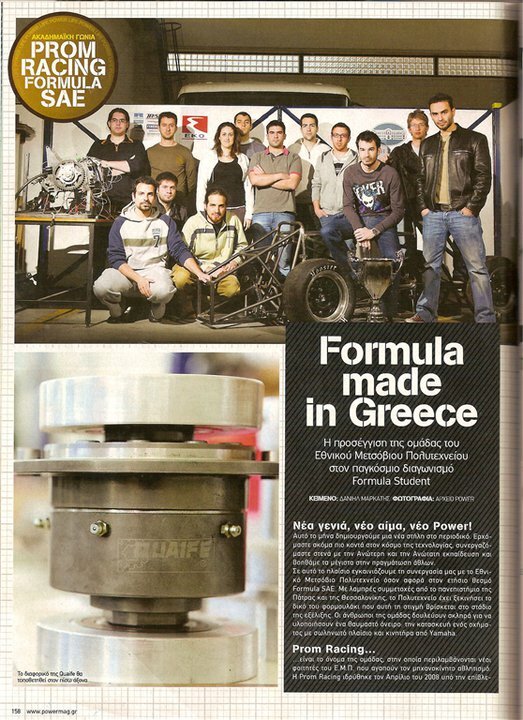 NTUA FSAE Team turns into ... Prom Racing! "Looking at the downstream of the human race and its weakness against nature, Prometheus decides to give it the fire. So, visiting the workshop of Hephaestus, he puts the fire in a hollow pole and offers it at the human race secretly." The above myth and the fact that Prometheus is the symbol of NTUA, our team decided to change the formal NTUA FSAE Team into a more symbolic name: Prom Racing! 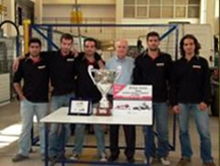 Classified first in FSAE Italy 2008 at Class 3! The last months efforts of the team finally resulted in the conquering of first place at the event of Italy at 20-22 of September. The team presented a realistic race car, without extragerations, managing to keep the cost at a low level, thus providing a score of 87/100 at the respective event of the competition. At the same time with its business plan, the team showed at the judges committee that it can not only sell its product, but also keep its customers for a long time, by offering really competitive after-sales services. The preparations and the first brainstorming for the mark II have now started. The concept will be the same, but all the aspects of our design will be reexamined and improves, in order for the Mark II to be even better and claim a good position, this time at Class 1. Read the press release of the team!